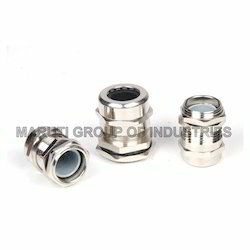 Manufacturer & Exporter of Cable Gland. Our product range also comprises of Ceramic Valve, Brass Ceramic Cartridge and Brass Sanitary Fittings.we pack these products using premium quality material to ensure their safe transit. We are instrumental in manufacturing, supplying and exporting high quality Cable Gland. The range made available by us is manufactured using optimum grade material so that it is in tandem with international quality standards. Besides, we pack these products using premium quality material to ensure their safe transit. Looking for Cable Gland ?